Premiere. 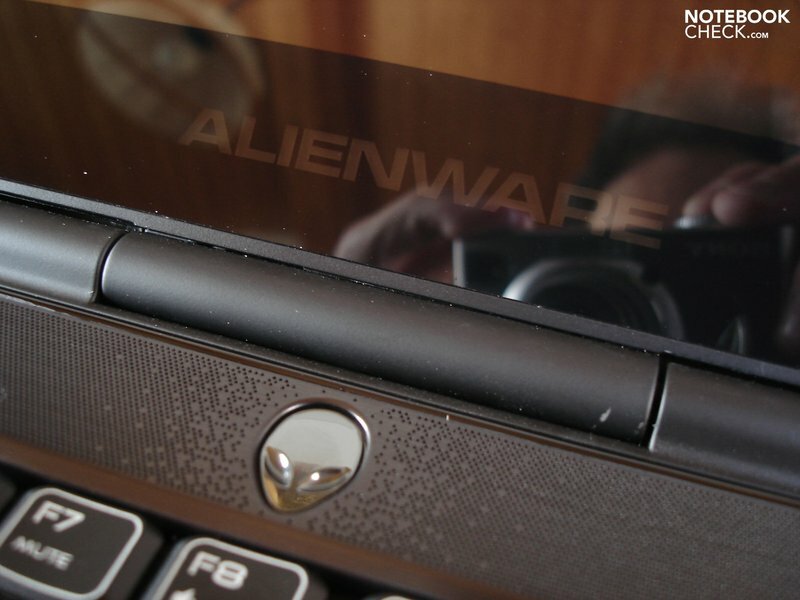 The M14x is Alienwares first 14 inch gaming laptop. 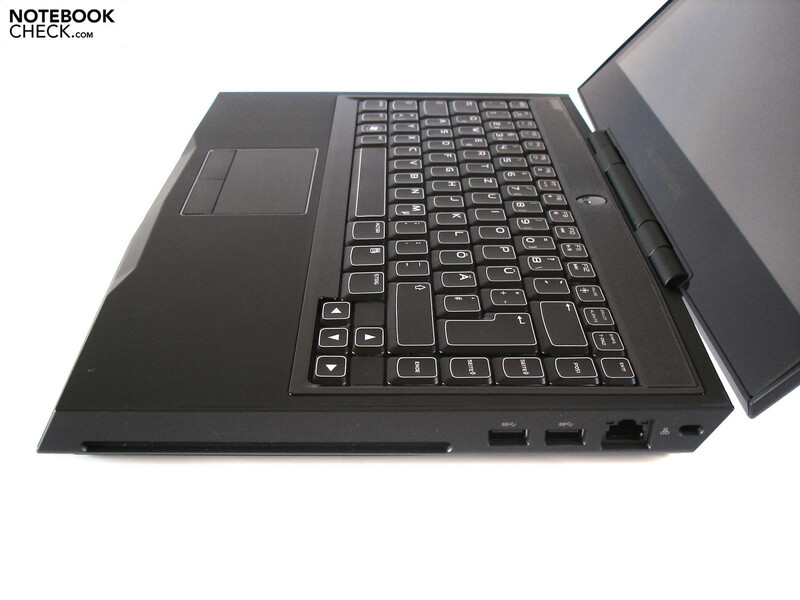 A quad-core CPU and GeForce GT 555M make the notebook unique, as this kind of hardware is usually only found in larger models, such as the Schenker XMG A501 or the Dell XPS 17. The M14x - another revolutionary model? Alienware has decided to add a 14 inch notebook to its already extensive line-up of gaming-oriented laptops (see M17x, M15x and M11x). Up till now, Gamers did not pay much attention to laptops below the 15 inch category, as those devices did not offer enough performance to satisfy their gaming needs. However, new technology has allowed manufacturers to create models such as the Acer Aspire 4830TG which deliver good performance and offer mobility. The M14x uses upper middle-class hardware and has what takes to be the next king of performance. The Nvidia GeForce GT 555M (DirectX 11 ready) is the dedicated graphics card installed in the M14x. The GT 555M is available in two variations: with 1536 MB or with 3072 MB memory. The CPU of the laptop is the latest quad-core from Intel's Sandy-Bridge generation. 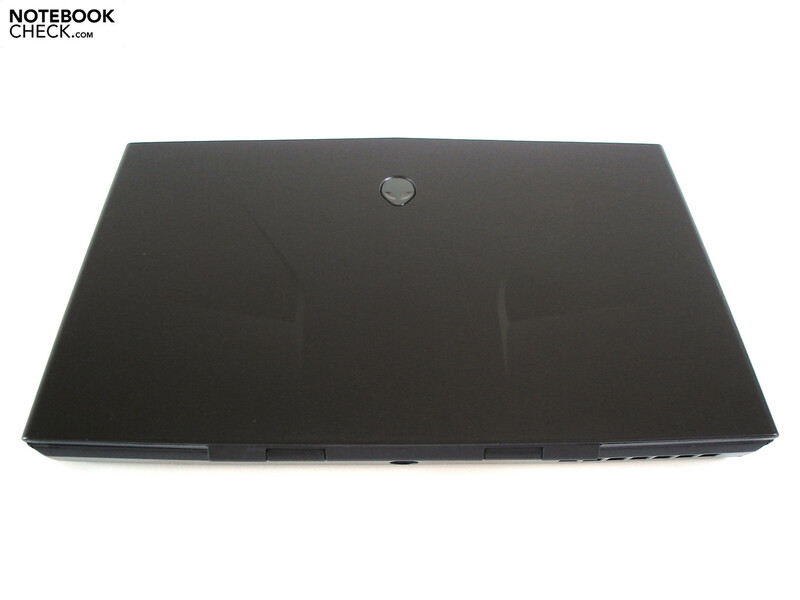 Alienware allows the user to choose between the Core i7-2630QM, the Core i7-2720QM and the Core i7-2820QM. The latest DDR3 RAM is available for the M14x and the buyer gets to choose between 4, 6 or 8 GB. 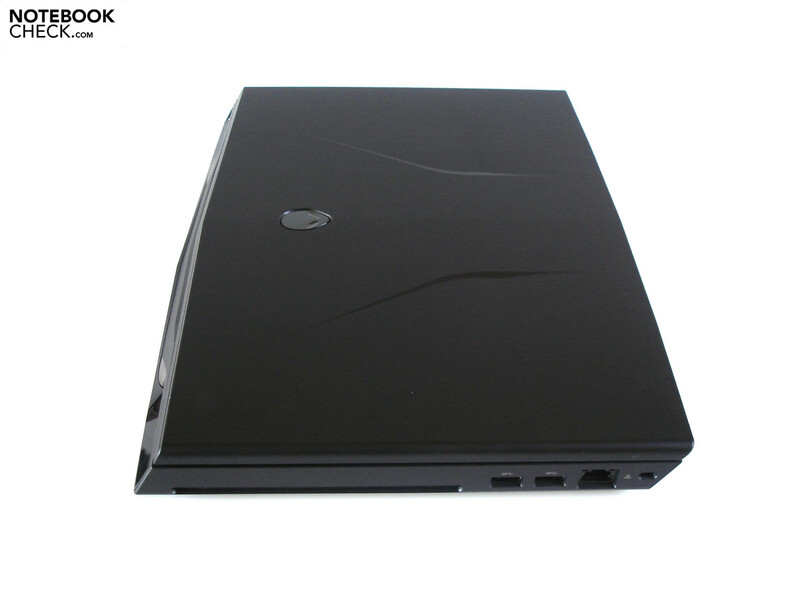 The manufacturer offers a few choices for the storage device: either a 500 or a 750 GB HDD (7200 rpm), or a SSD with 256 GB. The 14.1 inch display offers a resolution of 1366 x 768 pixels or 1600 x 900. Upgrading the operating system (to Windows 7 Professional or Ultimate) will not be necessary for most users, as the Windows 7 Home Premium version installed should take care of most things. The buyer can even choose the colour of the model: a conservative black or a flashy red. 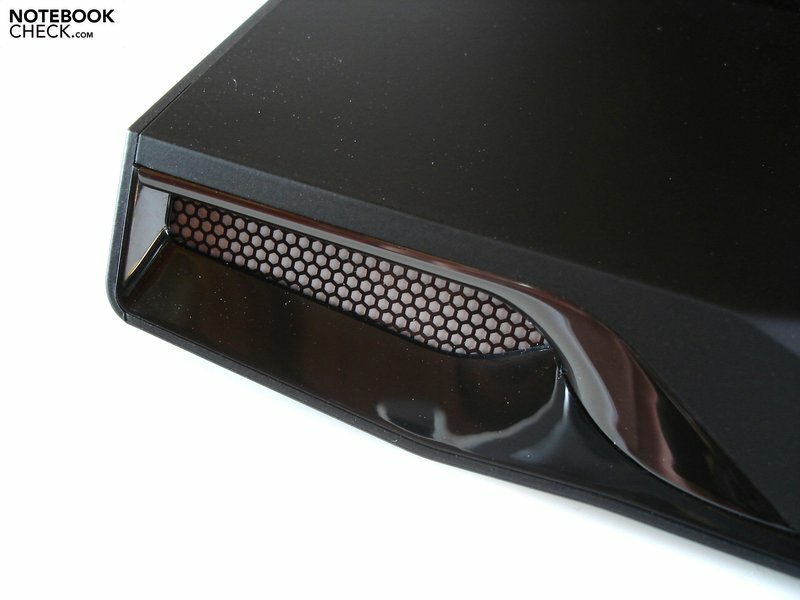 A pity that Alienware currently does not offer a Blu-ray drive for the M14x, instead a standard DVD burner is installed. The M14x is available for 1199 Euro in the basic configuration. Upgrades are highly overpriced and choosing them will increase the price of the laptop by multiple 100 Euros. Our well-equipped model cost 1804 Euro at the time of writing. 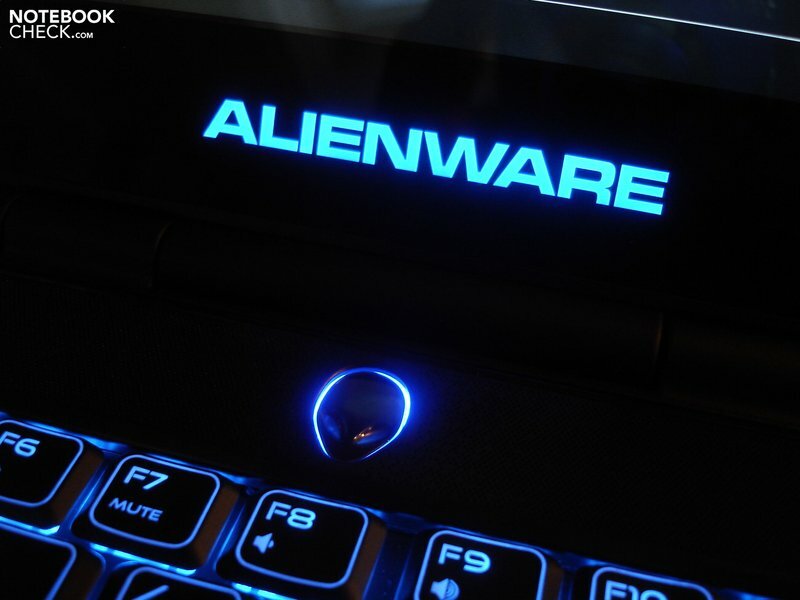 Amazing workmanship has always been Alienware's trademark. Like its sister models, the M14x draws attention with its futuristic design. 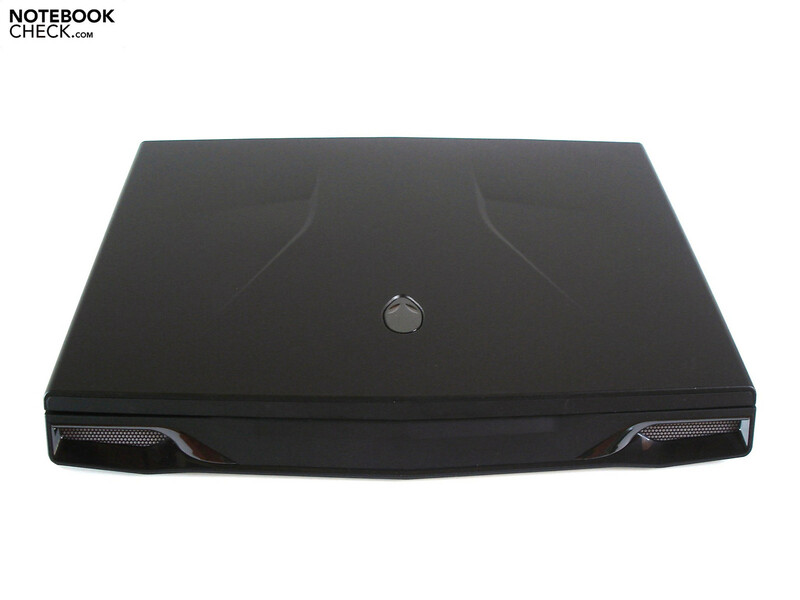 The Alienware models look a lot like sports cars with their slanted lines and enticing curves. 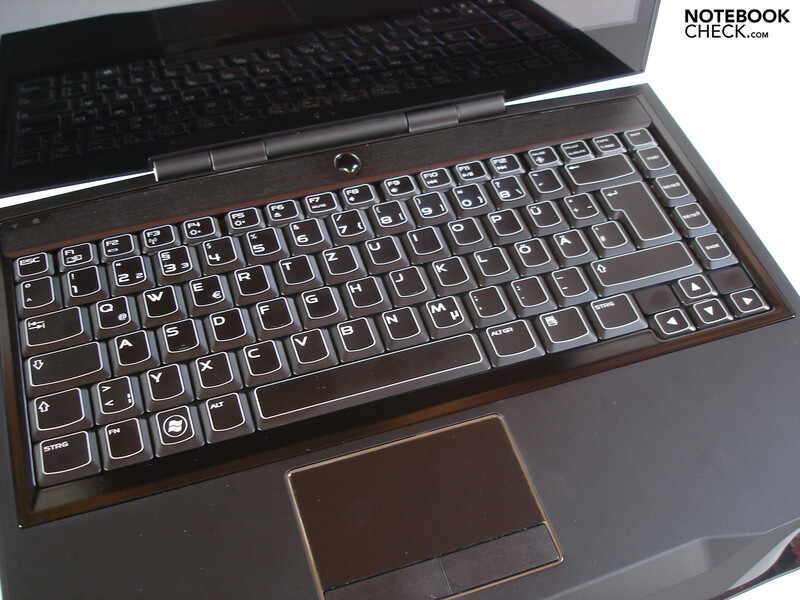 The "ruber coating"("Soft-Touch“) found on the notebook cover and the keyboard borders serves two purposes. First, it gives the laptop surface a nice, soft feeling, and second it prevents annoying visual imperfections such as fingerprints (matt surface). However, the glossy display is susceptible to dirt particles and fingerprints. The material quality is high, and it makes other laptops seem cheap. The sturdiness of the laptop is also very good - except for the slightly wobbly display. The case will only give way under enormous pressure. 2.86 kg total weight is a lot considering the 14 inch form factor. Most other models in this category are many 100 grams lighter. 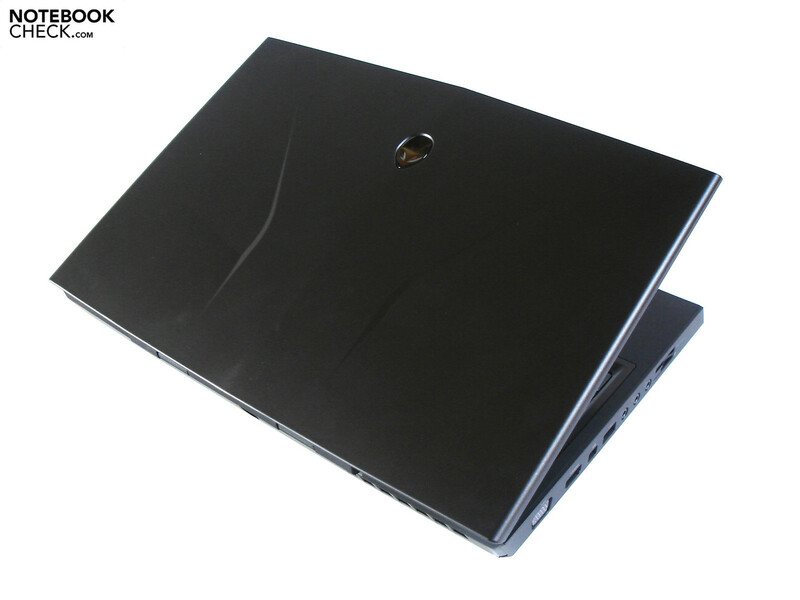 The case is also very deep, around 25.8 cm, which is usually seen in 15 inch notebooks. Frequent transportation will not be a problem thanks to the flat 150 W power adapter (540 grams). The extensive case lighting is the feature which sticks out the most. 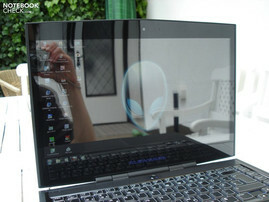 The alien head, the Alienware logo on the display border and two bars in the front can be lighted up. In addition, the keyboard (four zones) and the touchpad can also be lighted. Almost any colour imaginable can be used for the lighting, even a bright mix is possible. Friends and acquaintances will surely be jealous of this 14 inch model. 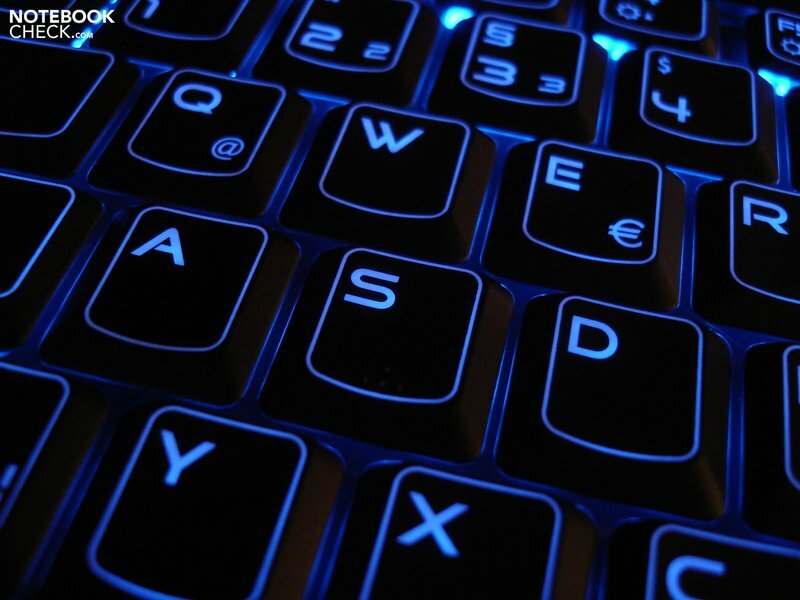 The lighting is not only nice to look at, it also allows the user to recognize which key is where even in a dark room. So anyone who likes to work at night, or play games till dawn, would find the laptops from Alienware perfect for their needs. The connectivity of the M14x is good, but not extraordinary. 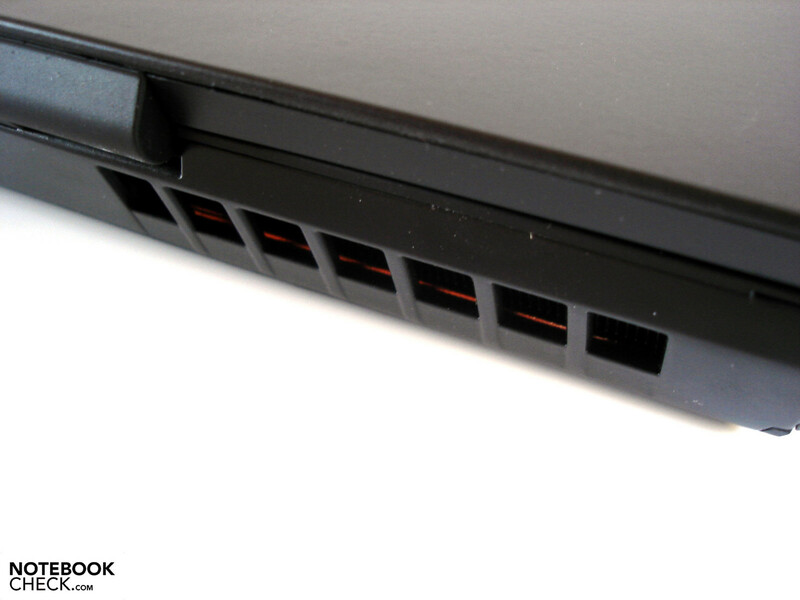 The left side of the laptop offers a VGA port, a HDMI port, and a DisplayPort interface. Three different monitor interfaces will ensure easy use of an external monitor with the notebook. 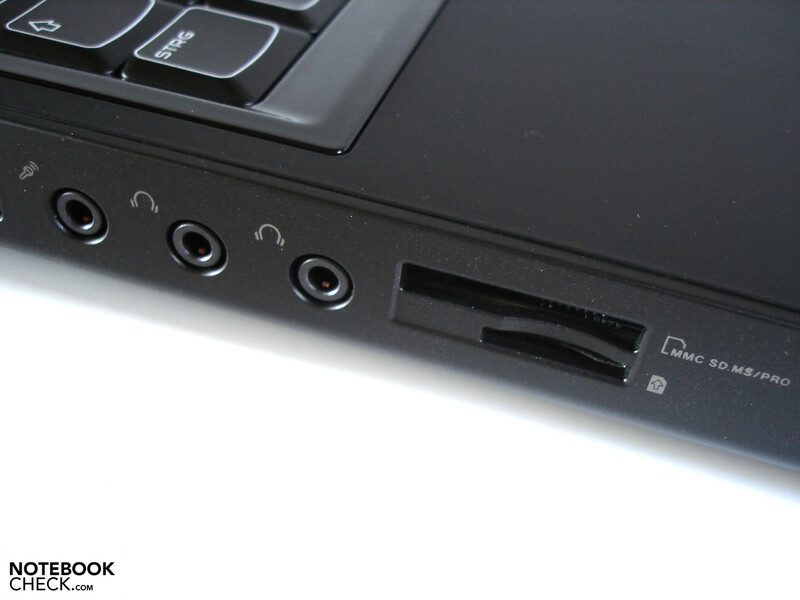 Headsets or external speakers can be connected using the three sound jacks also placed on the left side of the case. Finally, one USB 2.0 port, one 9-in-1 cardreader and a SIM card slot are also located on the left side. 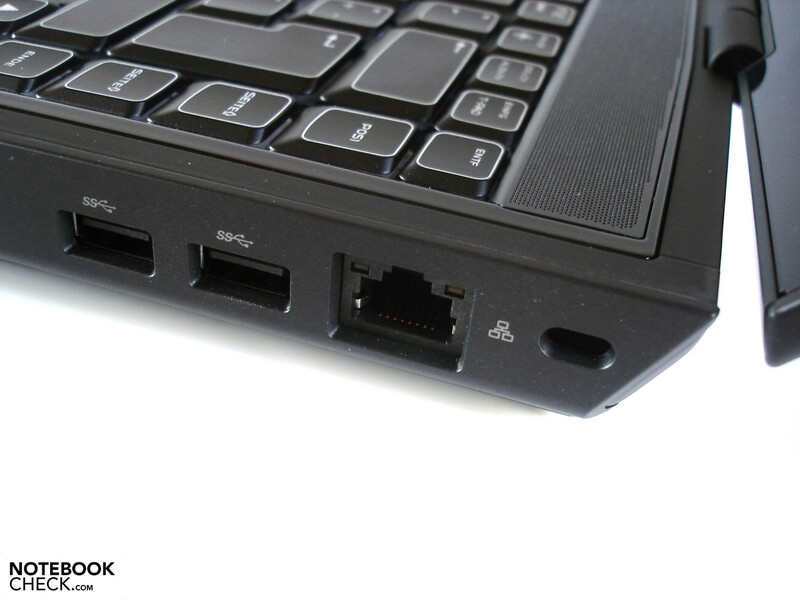 On the right side, the notebook offers a Kensington Lock, a RJ-45 Gigabit-Lan port and two fast USB 3.0 ports. Finally the power output is placed on the back. The positioning of the ports is decent. 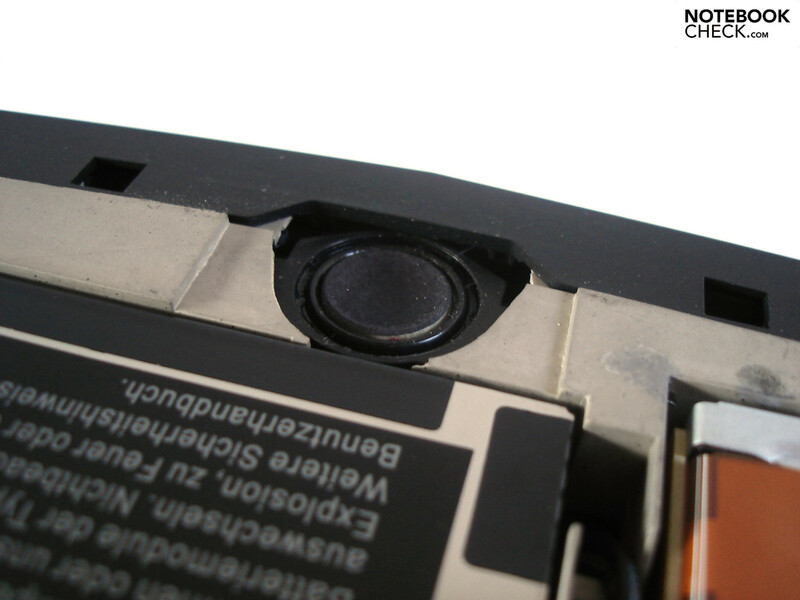 Except for the sound ports, all the interfaces are placed relatively far behind on each side, so as to allow enough space for the user to use an external mouse. Sadly, the M14x lacks an eSATA or Firewire port, and an ExpressCard slot. The wireless communication is commanded by Intel's WiFi Link 1000 in the basic configuration. This module supports WLAN standards b, g, and n. Our test model also included a Bluetooth 3.0 module. Alienware did not fill the M14x with "Bloatware". Although, the information area in the task bar is filled with icons, most of these are necessary or useful. As such, the M14x runs very fast right out the packing. Tip: To optimize the booting process, it is recommended that the user chooses which programs to run at the start of Windows. The most important software installed on the notebook is the "Command Center". 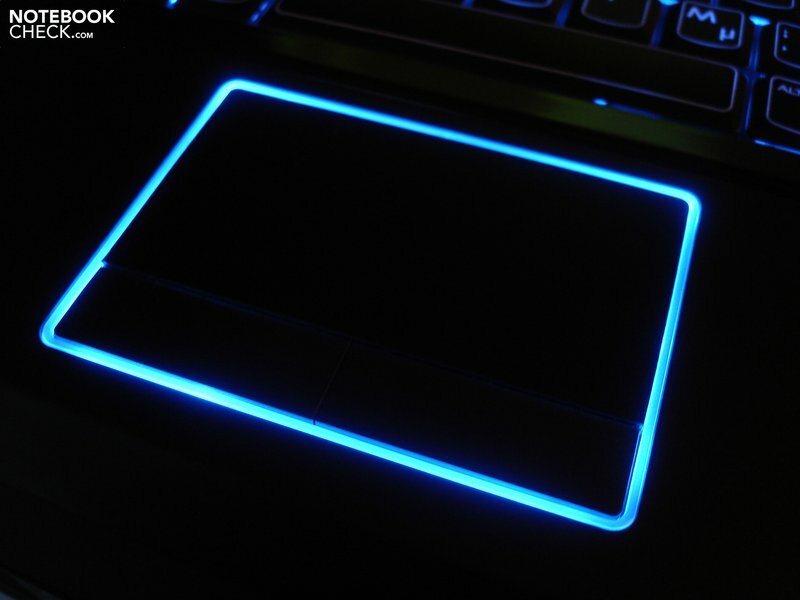 A stylish interface allows the user to configure the lighting of the case, the energy saving options, and the touchpad. The extras included in the M14x delivery package will satisfy buyers. 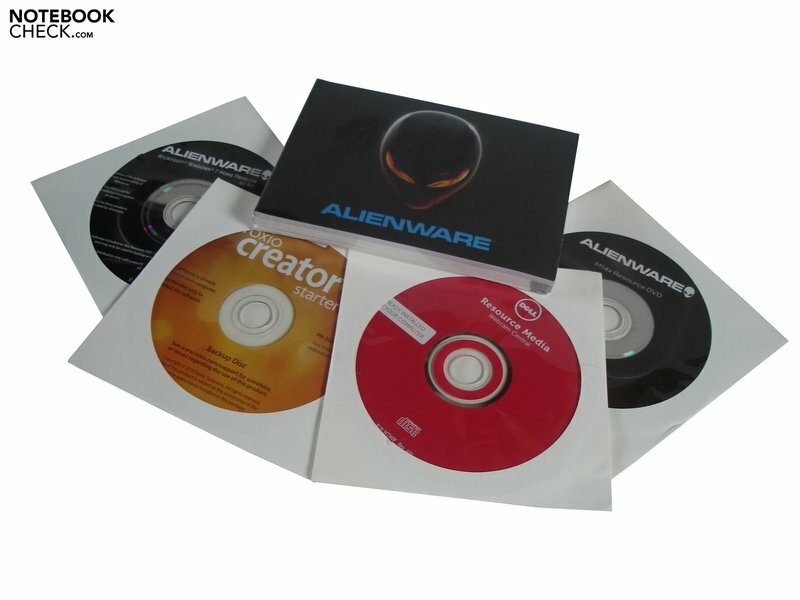 The battery and the power adapter are placed next to the multi-lingual manual, and a few DVDs: one recovery DVD, a driver and tools DVD, two resources DVDs and a DVD for Roxio Creator Starter. The warranty periods range from 12 to maximum 48 months. The warranty description found on the Alienware website mentions hardware support on the next work day. 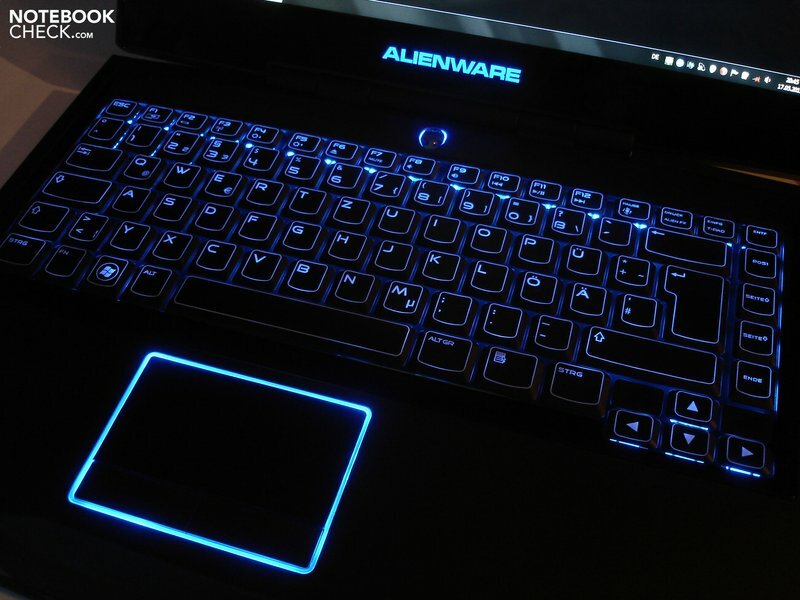 The input devices of the M14x have been designed very well by Alienware. The soft typing feel offered by the keyboard is very comfortable. The 17 by 17 mm big keys have good pressure point and stroke distances. Even the typing noise can be described as okay, althoug the "Enter" key makes a squeaking noise every time it is pressed. The layout is very good, and users will get used to it very quickly. 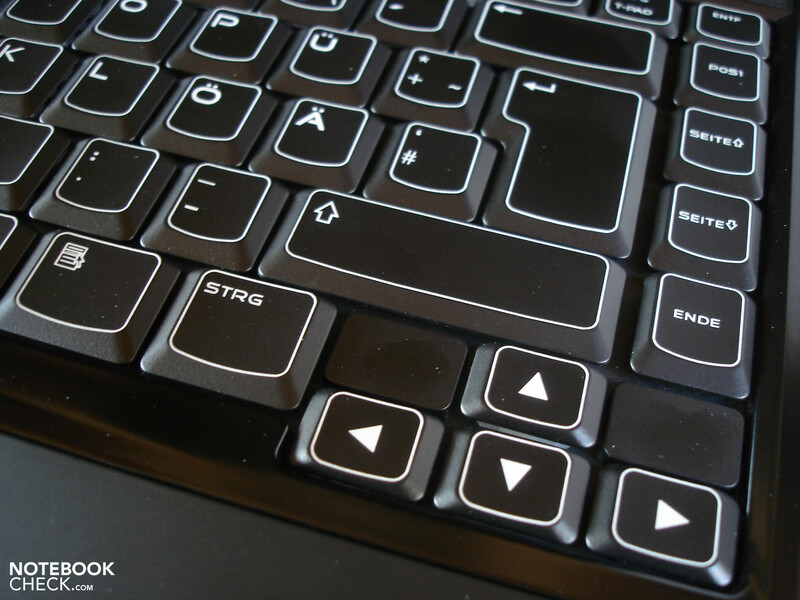 The Fn key combinations allow the user to control the brightness and volume of the laptop. 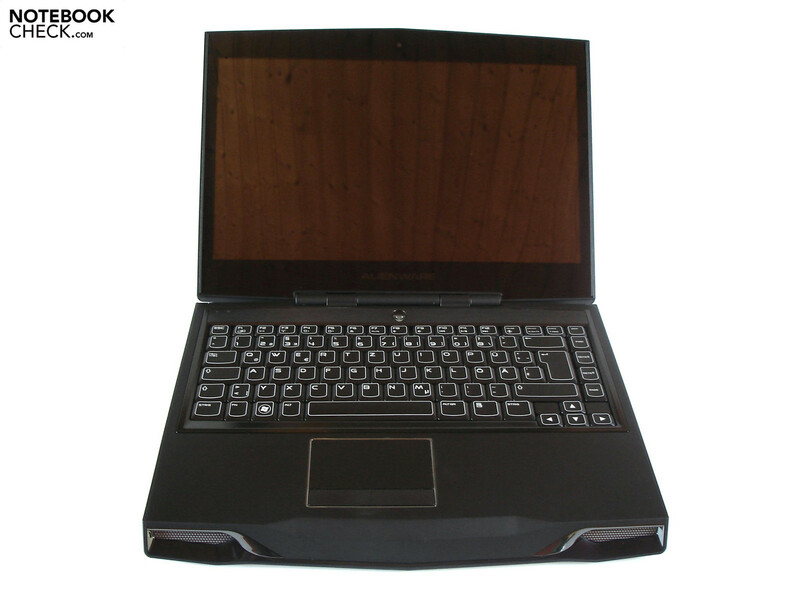 In addition, the user can also switch on/off the WLAN, Bluetooth and touchpad of the M14x. The Fn combinations even include multimedia control for easy playback of music and videos. The only thing missing is a numeric block, which could not be included due to the limited space. Alienware has decided to make the surface of the touchpad comfortably smooth, instead of using the knobby surface found in previous models. 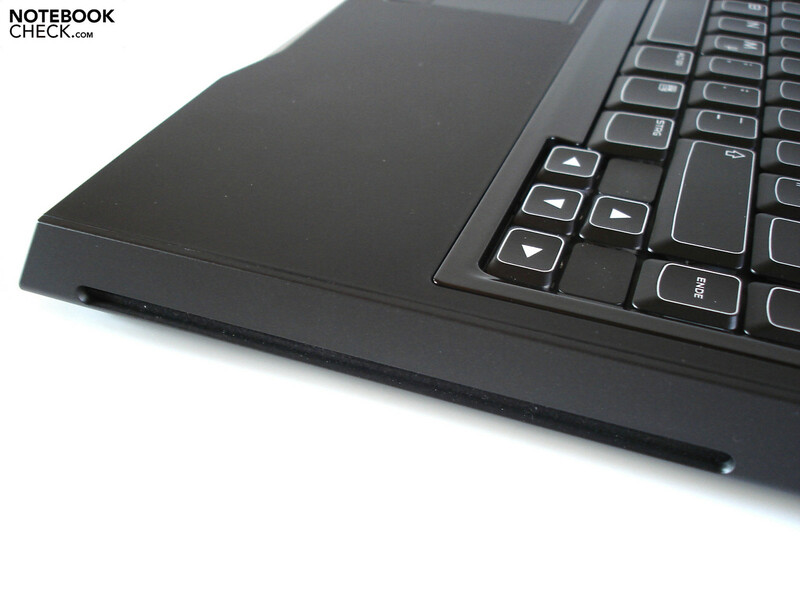 This allows the touchpad to offer great gliding support. The precision of the touchpad is great, and all the input was neatly received and executed. 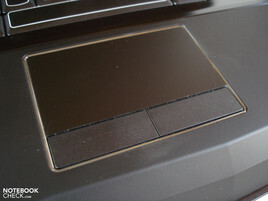 The dimensions of the touchpad are also okay: 81 x 44 mm. This should suffice most users. In the Command Center (Alien Touch), the horizontal and vertical scrolling bars can be turned on and off. The two mouse keys could be improved as they feel somewhat spongy in use. A crisper clicking method would be desirable. 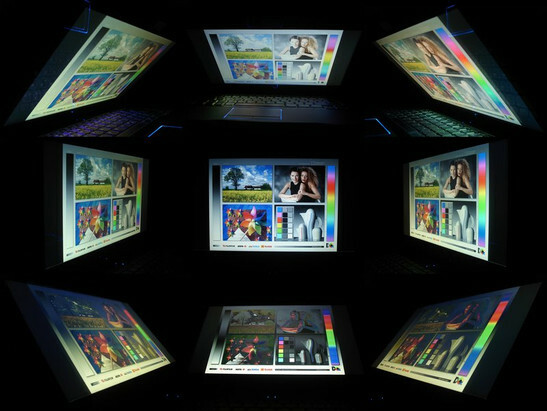 The 14.1 inch and 16:9 format WLED display has a native resolution of 1366 x 768 or 1600 x 900 pixels. Buyers should pick the HD+ version instead (1600 x 900 pixels - in our test model), as on one hand, the 1366 x 768 resolution is too small to work comfortably in, and on the other hand, the GeForce GT 555M can display modern games well even with higher resolutions. The values of the display are overall good. The installed SEC544B panel scores thanks to its great brightness (average of 266.6 cd/m²) which brings games and films to life. Thanks to the decent black value (0.56 cd/m²), black areas are not greyish as they often are in other notebooks. The contrast is also good: 504:1. The picture seemed subjectively rich and strong. However, the color space test showed a big flaw. The display does not encompass the AdobeRGB or the sRGB color space. Normal users will be able to ignore this deficit but professional picture and video editors will have to look for an alternative laptop. Despite the high brightness offered by the display, outdoors use is not recommended. The reflecting display surface can cause very strong reflections when exposed to direct sunlight and its use in those conditions will stress the eyes significantly. Indoors such issues will not rise, although the user will have to pick a good sport so as to avoid annoying reflections as far as possible. The viewing angle stability is above average. Horizontally the picture does not change much, even when the display is moved a lot. Vertically, the displayed picture gets distorted near the bottom of the screen when the display is moved. Overall, the display offers a good picture quality, much better than that found in a typical run-of-the-mill notebook. The user can enjoy his collection of media on this display without any problems. 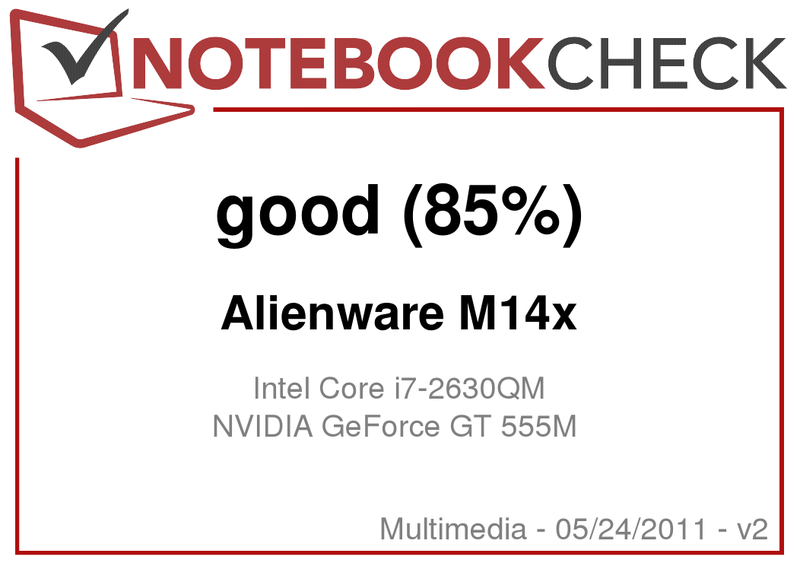 The strength of the installed CPU shows how dedicated Alienware is to great program performance. Dual-cores are not available for the model; the manufacturer forces buyers to choose an efficient quad-core CPU from Intel's latest line-up: the Sandy-Bridge generation. 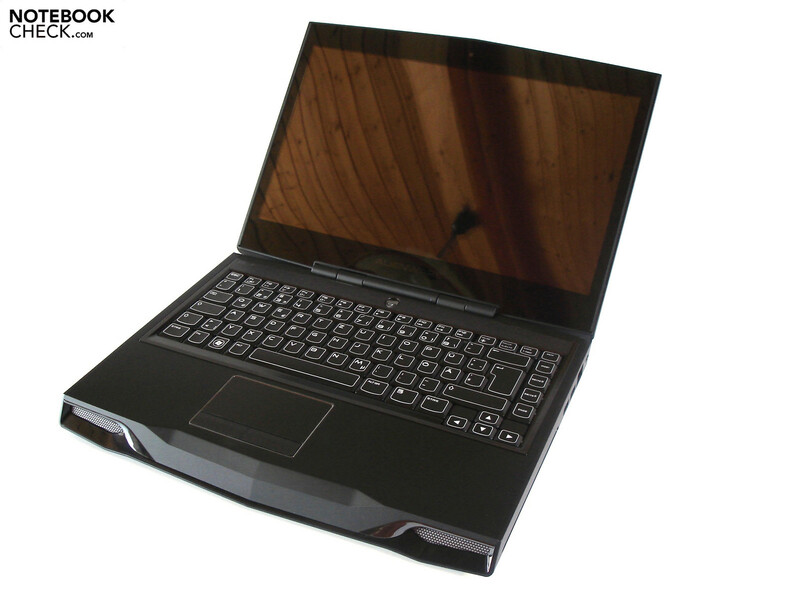 Our test model came with the Intel Core i7-2630QM which is a cheap model of the latest generation. While the usual clock speed of 2.0 GHz is rather poor, the processor can overclock up to 2.9 GHz (Turbo-Boost technology). The CPU also has the same amount of L3 cache memory (6 MB) as the more expensive Core i7-2720QM (Core i7-2820QM: 8 MB). Another important feature is the Hyperthreading technology. Thanks to the simulation of four virtual cores, the CPU can process up to 8 threads simultaneously. Intel deserves praise for its integrated graphics chip. 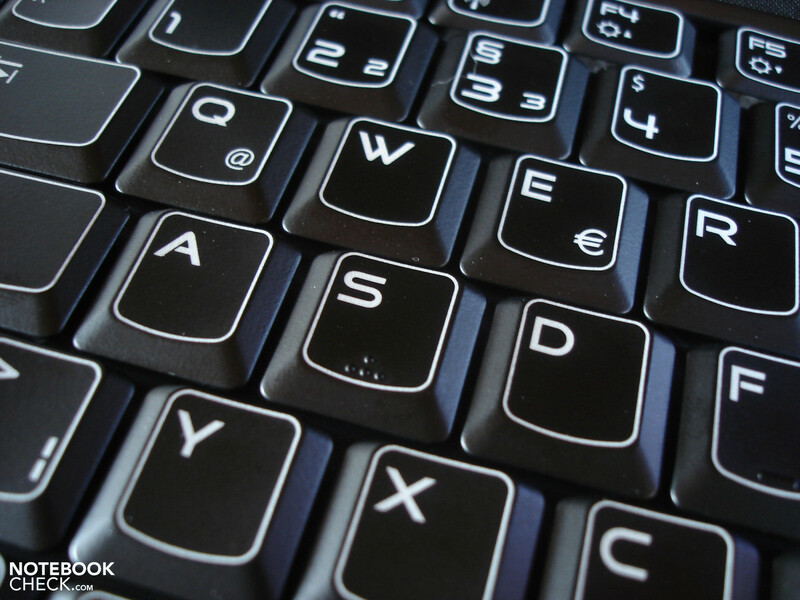 The weak HD Graphics 3000 allows notebook manufacturers to use power-saving GPU switching. The processor itself consumes quite a bit of power: up to 45 watts. The Sandy Bridge processors are all produced in the modern 32 nm form. The performance of the Core i7-2630QM is great. The Core i3- and Core i5 series are left behind in the dust, as soon as a program, which can use more than two cores, is executed. The extremely popular Core i5-2410M (Dell XPS 15) did not stand a chance in the Multi-Core Rendering test of the Cinebench R10 benchmark. The Core i7-2630QM ran away with first place with a 68% higher score (16545 to 9839 points). Although this difference in performance became slightly smaller in the Cinebench R11.5 benchmark, the quad-core i7 still remained clearly in first place. The Core i5-2410M (2.58 points) could not beat the i7s score of 4.15 points. Nvidia has delivered a very interesting graphic card for the buyer. The DirectX 11 ready GeForce GT 555M (Fermi architecture) is one of the few graphic cards of the upper middle-class which delivers appropriate performance. This statement is supported by the 144 Unified Shaders of the GT 555M. This shader count lies right between the GeForce GT 540M (96 Shader) and the GeForce GTX 460M (192 Shader). The clock speeds have not been changed. The installed GT 555M operates at 590 MHz (core), 900 MHz (memory) and 1180 MHz (Shader). The DDR3 VRAM of 3072 MB is big enough, but the memory interface can be a problem. A 192 bit memory interface can not keep up fast enough with modern games, and without the latest GDDR5 VRAM, the graphic card's small memory interface might end up limiting the performance. The functionality of the GT 555M is very good. The CPU use PureVideo HD for the decoding of HD media, and physics calculations are processed using PhysX. To extend the battery life of the M14x, Alienware has installed the automatic graphic switching Optimus technology. Nvidias Optimus technology allows the computer to switch between an integrated graphic chip and a dedicated graphic card. The goal of this technology is to achieve the optimal balance between performance and power usage. The Intel HD Graphics 3000 chip is used if the user is running low or not at all graphic intensive programs (Office, Internet, videos...etc.). As soon as a graphic intensive 3D program is started the notebook switches to the dedicated graphic card, the GeForce GT 555M. The switch is fast and there are no visible changes. Manual control is usually not necessary as Optimus chooses the graphic card correctly most of the time. Even if Optimus picks the wrong graphic chip, the user can configure the technology to fit his/her needs using the extensive Nvidia system settings. The 3D performance of the GeForce GT 555M was tested by us using AMD's competitor model, the Radeon HD 6770M (HP dv7-6030ew). In 3DMark Vantage, Nvidias GPU took second place. The Radeon HD 6770M was in the lead by 6% with a score of 5286 to 4997 points. The GPU score in the latest 3DMark 11, showed an increase in the lead of the AMD GPU with a score of 1346 to 1159 points (+16%). The user can install a 256 GB SSD instead of a fast HDD (7200 rpm - 500 or 750 GB). Samsung's SSD PM810 is much faster than a traditional HDD. A good HDD can only reach read and write speeds of 80 MB/sec or more, whereas the Solid State Drive can deliver 250 MB/sec (CrystalDiskMark). The access time of 0.2 ms of the SSD, is well out of reach for normal HDDs which have access times around 20 ms (HDTune). In everyday use, the installed SSD shows its potential: boot and loading times are relatively very short, files are transferred quickly, and the operating system has lighting fast reaction times. The program performance delivered by the M14x is first class. A cheap and efficient quad-core CPU from Intel's Sandy-Bridge generation accomplishes nearly all tasks with ease. The SSD storage device accelerates the system incredibly, and with a score of 14302 points in the PCMark Vantage benchmark, the solid state drive delivers the absolute best performance. Nvidias GeForce GT 555M is also a potent graphic card, which fits well with the other high-end hardware components. Upgrading the processor or RAM is not necessary, the M14x delivers amazing performance even with the basic configuration. The M14x had to prove itself in four popular games to pass our gaming perfromance test. In this test, the GeForce GT 555M had to compete, for the sake of comparison, against one of its most fierce rivals, the Radeon HD 6750M. As we could not test all the games properly on just one laptop, we used two models: a MacBook Pro 15 and a MacBook Pro 17 (both are equipped with Radeon HD 6750M). Both notebooks also have the same processor, the Core i7-2720QM, and so we were able to keep the difference in CPU influence at a minimum. The visually extravagant Ego shooter game pushed the M14x to its limits at maximum settings. A combination of 1920 x 1080 pixels and a setting of "Extreme", lowered the frame rate down to an average of 12.9 fps. We had to lower the resolution to 1366 x 768 and set the graphics to "Very High" so as to run the game fluidly. We recorded a good 40.8 fps, for the intro movie (U-Boat) of the single-player campaign. AMD's Radeon HD 6750M lost this round with a frames rate of 38.0 fps (7% less). The hardware requirements of the immensely popular Call of Duty: Black Ops are far lower. Even with very high details, 4x anti-aliasing (AA), 8x anisotropic filtering (AF) and a resolution of 1920 x 1080 pixels, the M14x ran the game fluidly at 43.2 fps. The Radeon HD 6750M lay far behind with a frame rate of 33.0 fps (31% less). Anyone who wants to enjoy the good visuals of this Real-time Strategy game, needs to have a middle-class graphics card. The resource-consuming intro sequence ("For the Swarm") was played at 24 fps (1920 x 1080 resolution) by the GeForce GT 555M. The Radeon HD 6750M delivered nearly the same performance (23.9 fps). With a resolution of 1366 x 768 pixels and high details, th game ran smoothly at a great 46.2 fps. This fun Battlefield: Bad Company sequel needs a high-end graphics card to run smoothly at maximum settings. We ran the game with high details, 4x anti-aliasing, 8x anisotropic filtering, and a resolution of 1920x1080 pixels. The end result was a mere 22 fps (Intro movie of the single player campaign - boat sequence). The M14x can run the game somewhat fluidly with high details, a resolution of 1366 x 768 and 4x anisotropic filtering. The GeForce GT 555M beats the Radeon HD 6750M a third time (41 to 39 fps). From a gamers point of view, the GeForce GT 555M is a good graphic card. With the native HD+ resolution (1600 x 900), the delivered performance will suffice for high details. Features like anti-aliasing and anisotropic filtering can also be used. The user will only ever have to drop the resolution and graphic quality when running extremely demanding games like Metro 2033 or Crysis 2. Full-HD resolution (1920 x 1080) do not suit the GeForce GT 555M. At the very least a GeForce GTX 460M is necessary for laptops to display material fluidly at that resolution. The GeForce GT 555M does not need to hide from its AMD competition. The Radeon HD 6750M falls overall behind the GT 555M in terms of performance, and so the dedicated graphic card of the M14x lies at the same level as the Radeon HD 6770M or HD 6850M. The high noise emissions under heavy load are probably the biggest weakness of the M14x. When running demanding 3D applications (like games), the cooler fan runs extremely loud and will distract users. In fact, the noise emissions are so high that they overlie the game sounds. As such, good headphones which block out surrounding noises, or external speakers with a high volume setting are necessary to properly enjoy the game. Most users will be borderline fine with the emissions, however, sensitive users should avoid the M14x. On the other hand, when surfing on the Internet or watching a film (less demanding), the noise emissions are nonexistent or low. 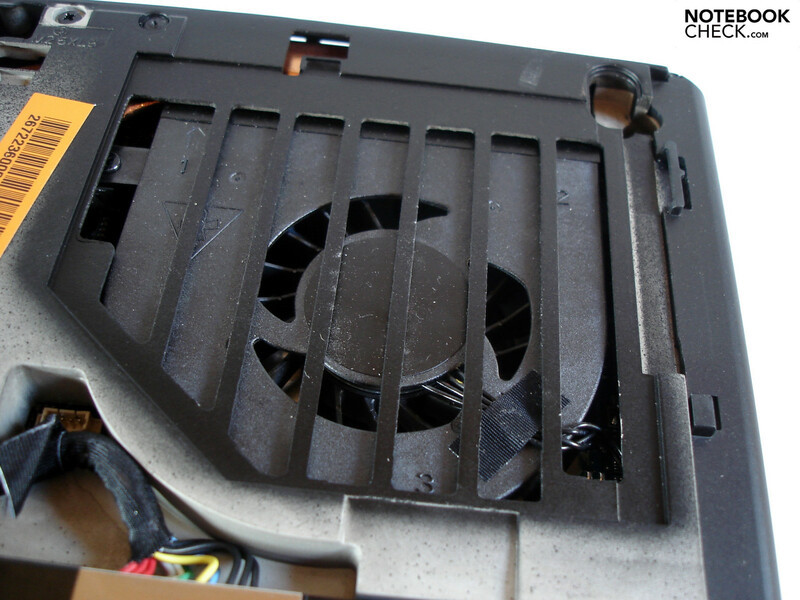 The cooler fan is known to turn off for long periods of time, and then switch on shortly and work at an audible level. So, all-in-all, Alienware has quite a lot to deal with. The manufacturer absolutely has to make sure that the notebook reacts within certain limits under load. Even turning up the cooler fan now and then in normal use would be fine. As such, the noise emissions are a flaw that can not be ignored. The temperature emissions of the case can be described as moderate. 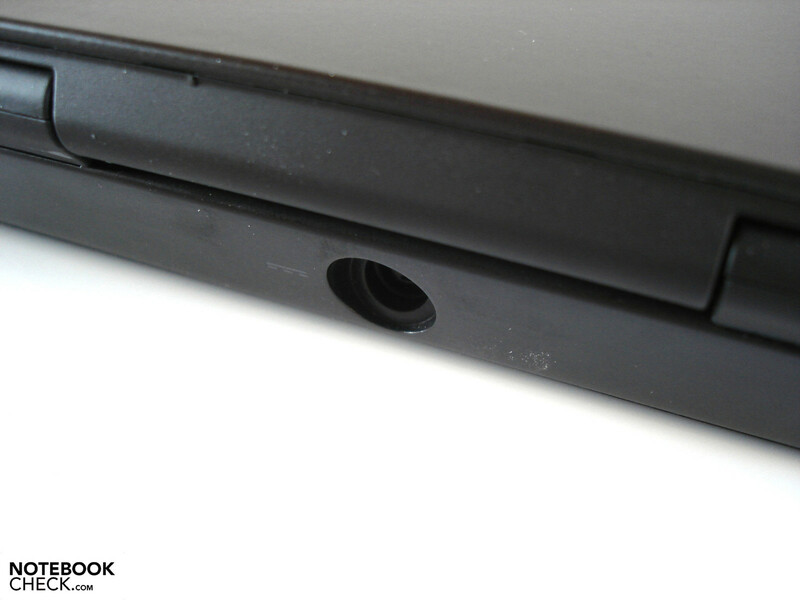 When idle, the notebook surface remains comfortably cool at around 28°C (quite low for a gaming notebook). Even when the laptop is under heavy load, the hand-rest regions barely warm up to a maximum of 29°C, which means that users can comfortably play games for long periods of time. The rest of the case heats up considerably, especially near the back, to 39°C (top) and 45°C (bottom). The temperatures the hardware components reach are no laughing matter. For example, the processor can be pushed to its very limit. We ran the stability test of the Furmark and Prime benchmarks for several hours, and during this time we noticed that the Core i7-2630QM CPU throttled down to 1300 MHz sporadically. However, the reader should note that this extreme scenario (full load for several hours) will probably not occur in everyday use. So the "throttling" problem should not be an issue for the buyer. (+) The maximum temperature on the upper side is 38.8 °C / 102 F, compared to the average of 36.5 °C / 98 F, ranging from 21.1 to 71 °C for the class Multimedia. (±) The average temperature of the palmrest area of similar devices was 29.1 °C / 84.4 F (+0.2 °C / 0.4 F). The sound quality of the M14x sets standards for other manufacturers. 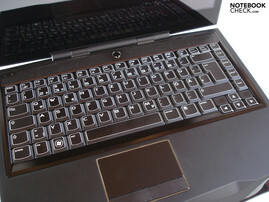 Alienware uses a 2.1 speaker system: two speakers above the keyboard and a subwoofer under the laptop. Such great sound is rare to find in the notebook class. The sound is balanced, loud, and natural. The speakers score well with a high maximum volume level, and the laptop can even be used for presentations in big rooms. Audiophile users will enjoy the extensive options offered by the MaxxAudio technology (see screenshot). Users who do not enjoy spending hours tuning the sound output to perfection can use the pre-defined scenarios (Films, Music, Language and Gaming). The mobility of the M14x is quite special. 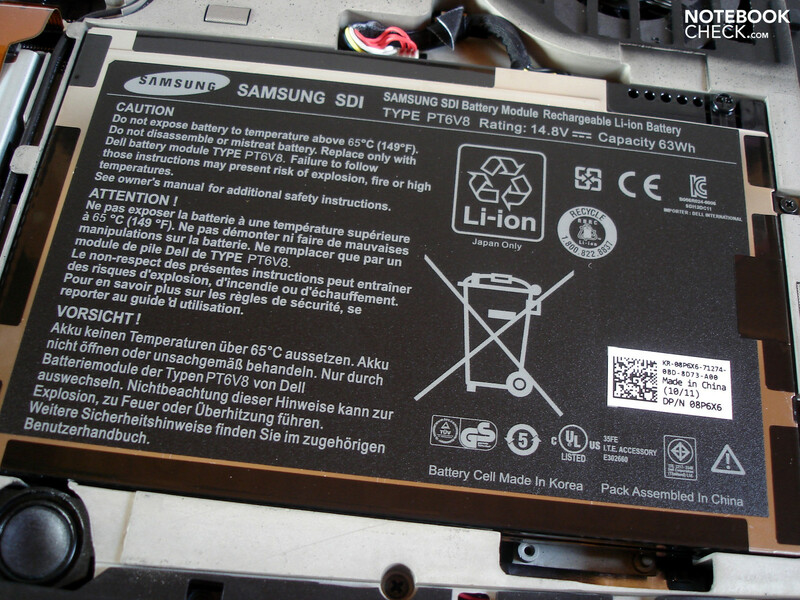 The M14x hides a 8 cell battery from Samsung (63 Wh) beneath its hood, and thanks to the Optimus technology, the battery can delivery great run times. We calculated how long the 14 inch laptop could survive without being plugged into a wall socket using the Reader's test from the Battery Eater benchmark. The end result of 7 hours and 17 minutes (minimum display brightness, and all energy-saving options turned on) is impressive. Wireless surfing using the WLAN module is not a problem either. Microsoft's Internet Explorer ran with maximum brightness and energy-saving options set at medium for around 4.5 hours. The notebook even lasted 4 hours during the DVD playback test, and so users can even watch extremely long films (such as the Ultimate Cut of Watchmen) on the go. However, when the dedicated graphic card comes into play, the run time sinks down to around one hour (65 minutes in the Classic test from the Battery Eater benchmark - maximum brightness and energy-saving options all deactivated). The energy usage is acceptable considering the performance delivered by the M14x. 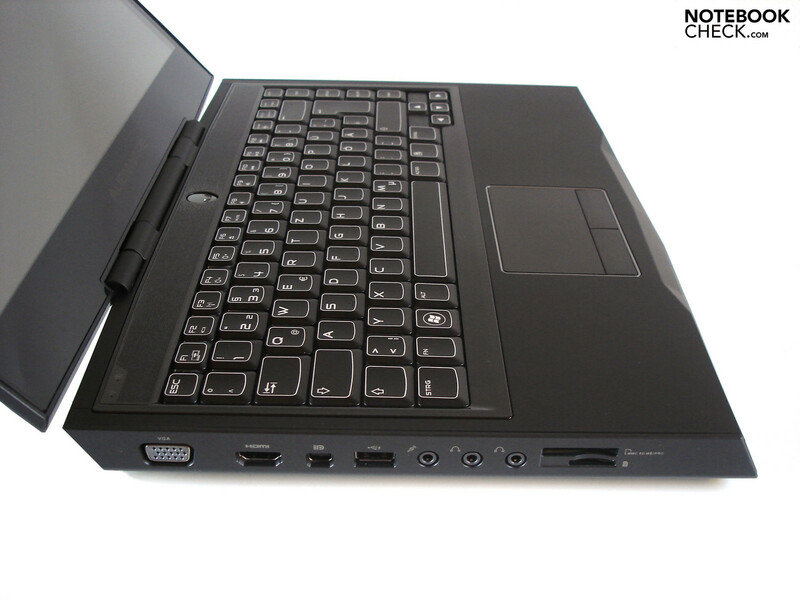 The notebook consumes a mere 14 to 22.8 W when idle as long as the integrated graphics chip is active (HD Graphics 3000). 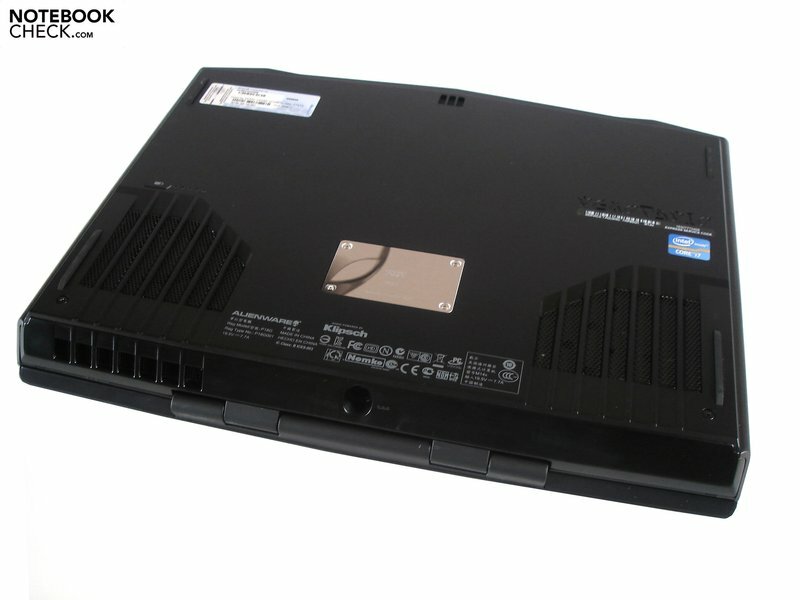 Under heavy load, the laptop's power usage increases rapidly to 96.6 to 124.5 watts. The 15 inch Schenker XMG A501, which uses a Core i5-2410M CPU and GeForce GT 555M graphic card, consumed less power under heavy load than the M14x. 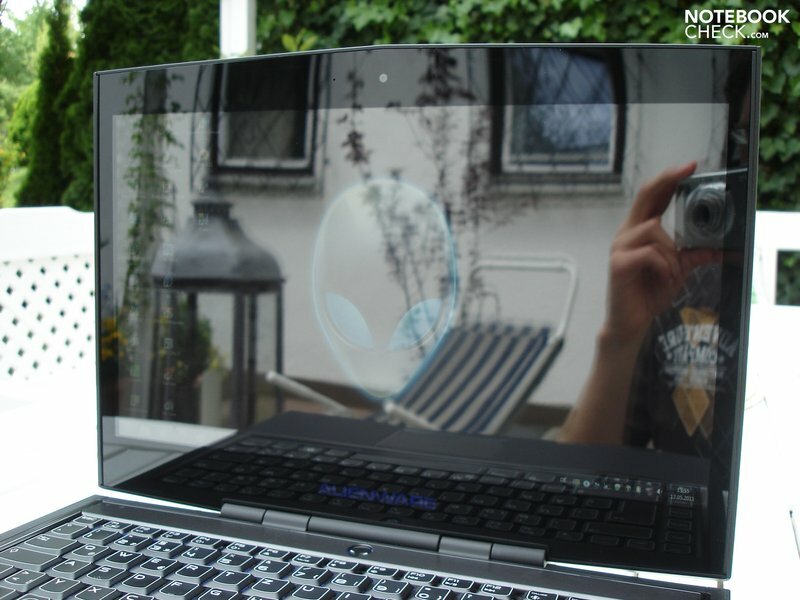 Alienware's 14 inch experiment can be considered a success - for the most part. 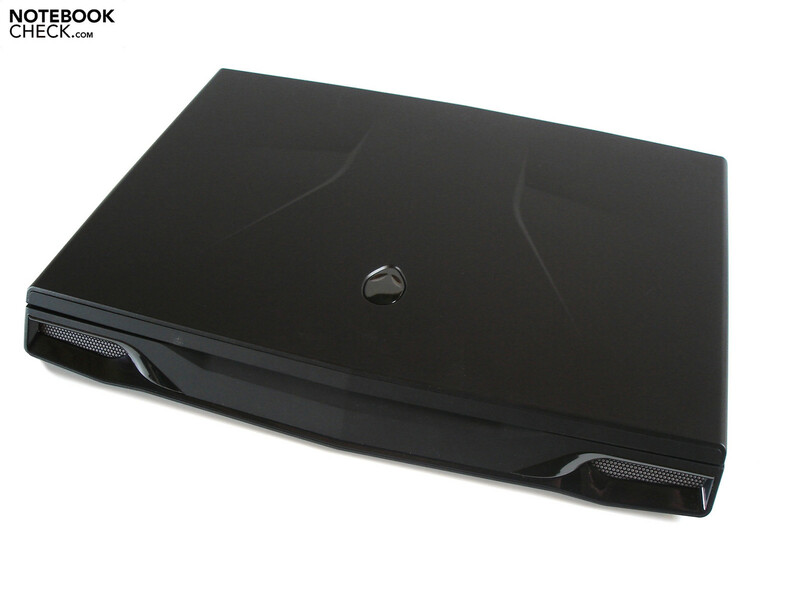 As expected of Alienware, the beautiful combination of a stylish case, excellent workmanship, high-quality materials and extensive lighting is sure to attract many an eye. 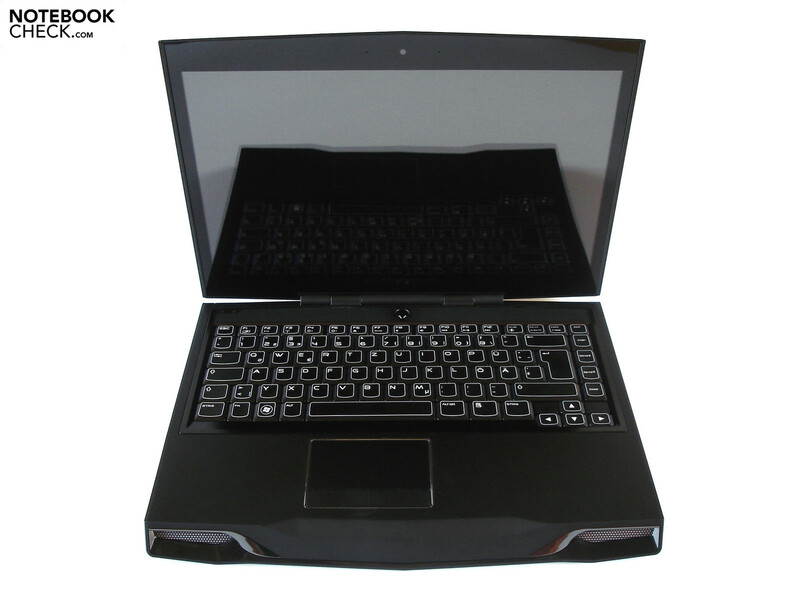 The well-designed input devices and moderate surface temperatures are more plus points; the laptop is very comfortable to work with. The performance is good, although the graphics card is a bit too slow for passionate gamers. The quad-core CPU and SSD storage device make the program performance and system reaction times shoot up into the sky. 14 inch laptops as fast as this one are rare to find. The picture and audio quality are just as good; both the display and the sound system are sure to excite users. The significantly loud noise emissions from the cooler fan under heavy load tarnishes the otherwise overall great impression left by the M14x. Although the battery life is decent, the mobility could have been better. Even the weight and measurements of the device tend towards the 15 inch class, and the glossy display causes strong reflections. This high-performance 14 inch laptop is designed for those users who enjoy great design and performance but at the same time are willing to turn a blind eye to the relatively high noise emissions and easily dirtied display. Buyers who do not fit this description might be happier with a cheaper laptop like the Schenker XMG A501. The M14x is available in "Stealth Black" and "Nebula Red". The "Alien" head is the trademark of Alienware notebooks. Fingerprints accumulate quickly on the display border. The white bordered keys are very stylish. 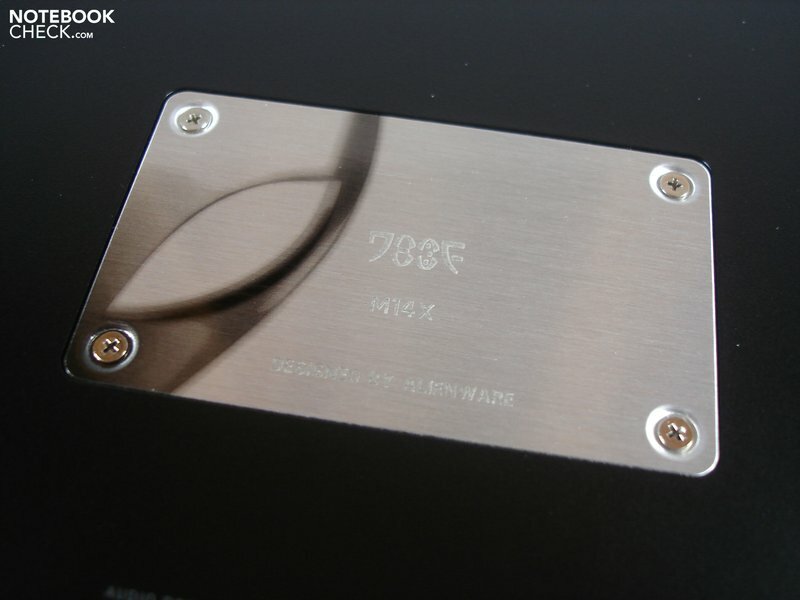 The nice name plate is supposedly engraved using a laser. Thanks to the lighting, working in the dark will not be a problem. A numeric block is not included. The touchpad surface is smooth. Two speakers are placed above the keyboard. The optical drive does not have a covering flap. 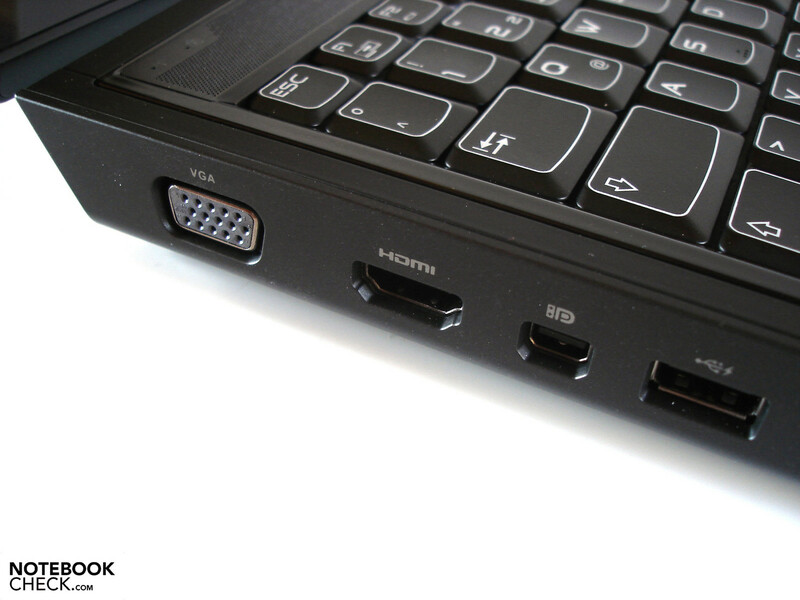 On the right side, two fast USB 3.0 ports are included. The power outlet is placed on the back. Warm air is pushed out of the back of the laptop. External monitors can be plugged in using the VGA, HDMI, and (Mini-)DisplayPort interfaces. The left side of the M14x even has the SIM card slot. The flat 150 W power adapter can warm up significantly when the laptop is under heavy load. Various elements can be lighted. Four GB RAM will suffice most users. The WLAN card is hidden under the battery. The glossy display causes distracting reflections. The 14-inch case weighs roughly 3 kg. A futuristic design might not appeal to everyone. 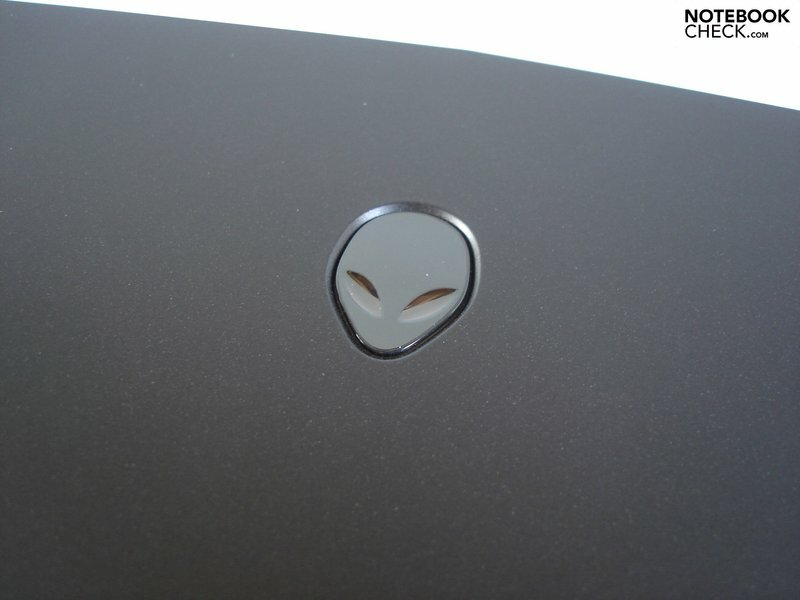 Alienware uses a soft rubber coating. The display can be opened up to 135 degrees. 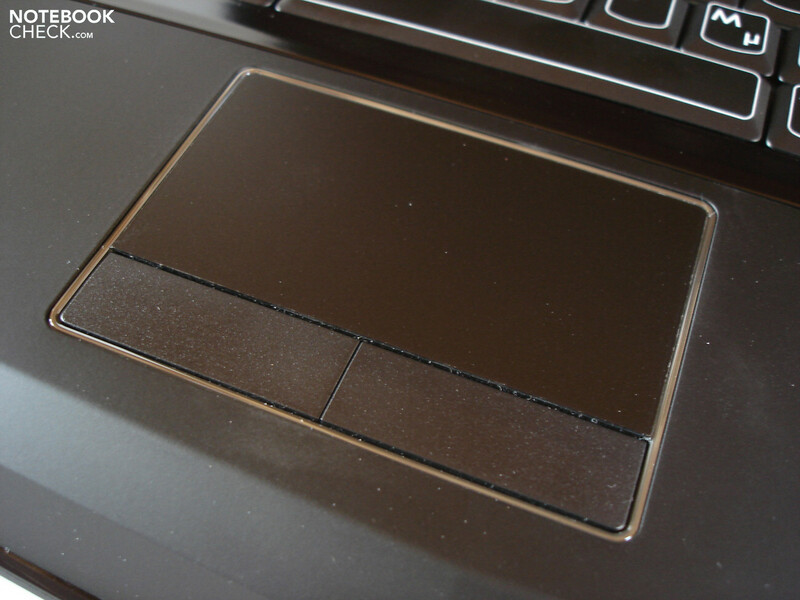 The matt soft touch surface is relatively resistant. 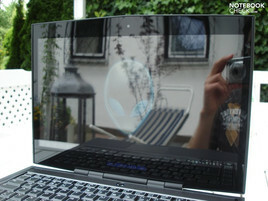 Alienware has placed two microphones and a webcam over the display. The shape of the M14x could be described as slanted. The input devices are very good. Most of the ports are placed on the left side. A normal DVD burner is installed as the optical drive. 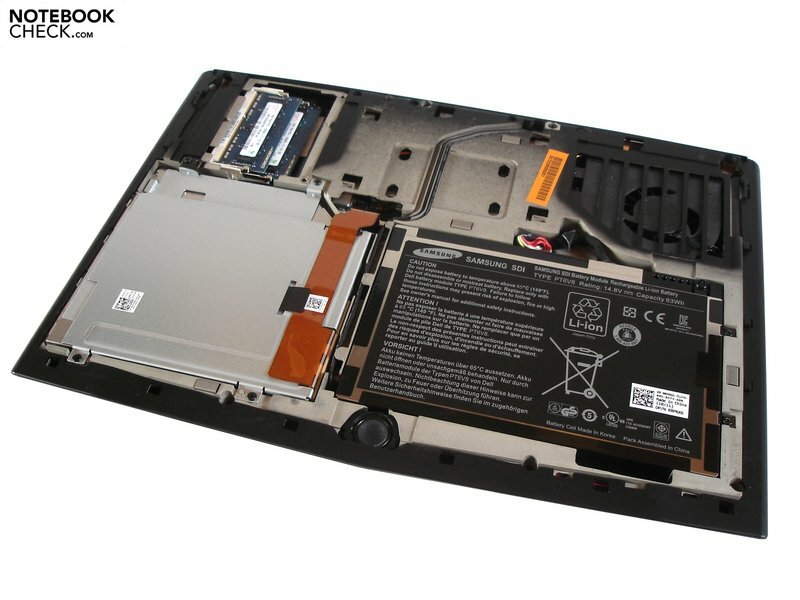 Two screws need to be removed to take out the base flap of the laptop. The hard disk is not directly accessible. On the bottom, a small subwoofer is placed. 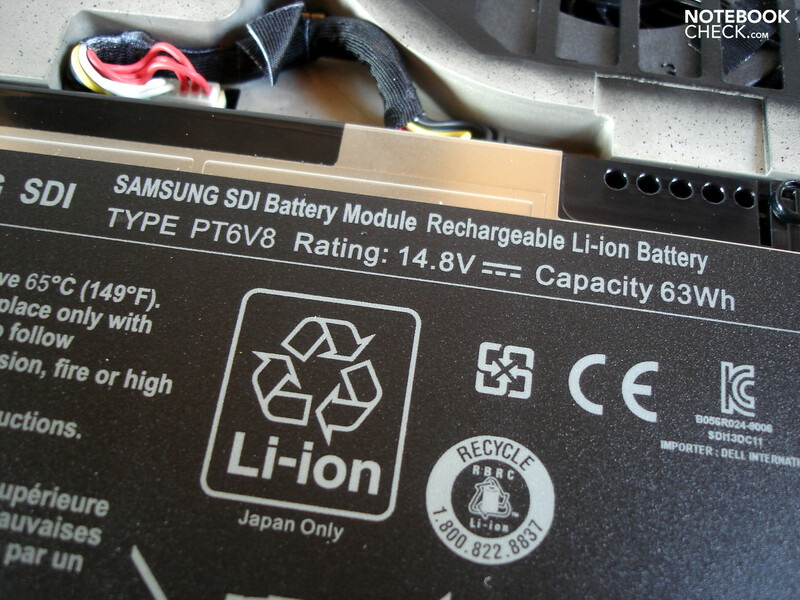 The Lithium Ion battery is screwed into the model. Thanks to Nvidia's Optimus technology high run times are possible. 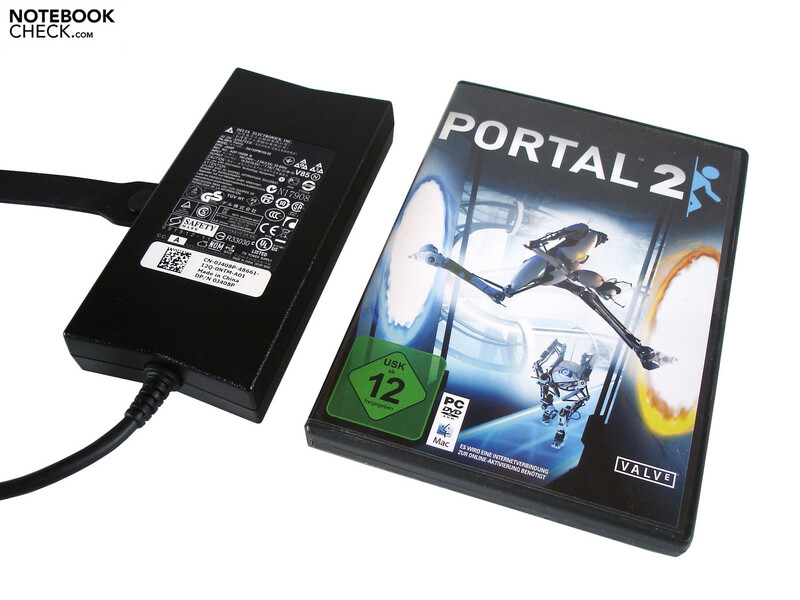 A Recovery DVD is also included in the M14xs delivery package. The high picture quality of the HD+ display. A lower noise emission under heavy load. The great sound offered by the integrated 2.1 speaker system. 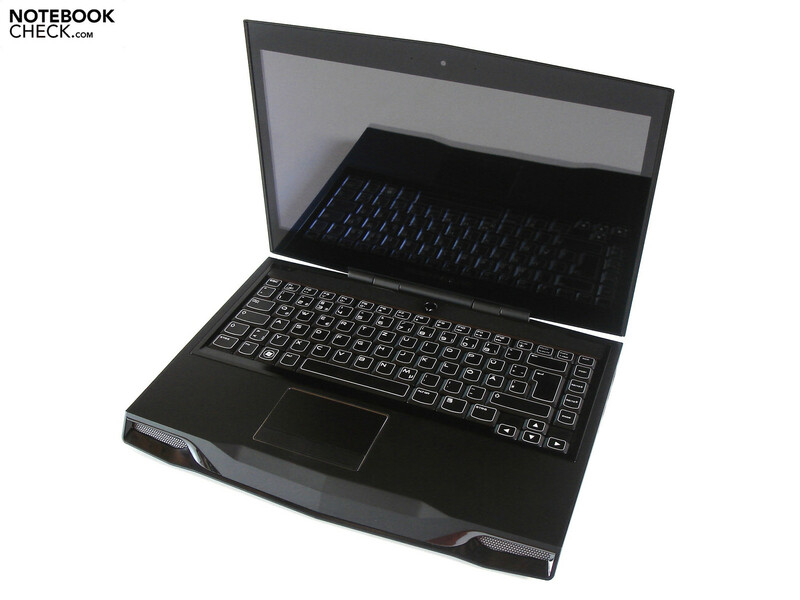 14 inch notebooks with good graphic cards such as the Acer Aspire 4830TG or the HP Envy 15.